This year's art contest featured artists from all over the world and of all ages, both amateur and professional. It was difficult to go through the hard work of all these artists and select the winning pieces, but we are pleased to announce the winner of this year's Book of Mormon Art Contest. Courtney von Savoye is an Art Major in Brigham Young University Idaho. She has loved art her whole life and draws inspiration from Don Bluth and Walt Disney.This piece was inspired by Alma 32 in the Book of Mormon. In this chapter Alma explains the nature of faith being something believed and not seen. As faith grows it is like a seed being planted in a person's heart and if they are faithful and learn more of the gospel they are blessed with fruit. This is represented in this piece with a girl giving thanks for the fruit that was grown in a barren desert. Since she was faithful she was able to receive her reward and can now grow stronger. The moon and star represents the spirit since her gaze is aimed up toward heaven. Andrew Knaupp graduated from Brigham Young University with a BFA in Visual Arts Design-Illustration. This piece displays Mary Elizabeth Rollins reading the first copy of the Book of Mormon to arrive in Kirtland Ohio. She was so excited to get her hands on a copy, that she read the entire book late into the night, and returned her borrowed copy the next morning. Melissa Horlacher began painting in 2013 and has a small business called Melissa Michiale Paints. She graduated from Brigham Young University Idaho in 2015 and lives in Provo, UT with her daughter and husband. Her fascination with the Jaredite people and history led her to create this work. This watercolor portrays the large Jaredite stone referenced in Omni 1:20. The depiction of the large Jaredite stone is based on Mesoamerican Stelae. It contains an engraving of the great warrior Coriantumr, with his genealogy and tales of victory in characters around him. "Brought to the True Knowledge"
The Book of Mormon is a masterpiece with vivid scenes and evocative narratives that bring one closer to God. Book of Mormon Central uses many images on our website and in our videos to portray Book of Mormon ideas, but we always need more. We want to encourage the creation of new Book of Mormon art to illustrate this powerful book, so that more may come to know that it is "Another Testament of Jesus Christ." If you are an artist or know an artist, share this event and consider participating in our art competition for a chance to win and be featured on our website. 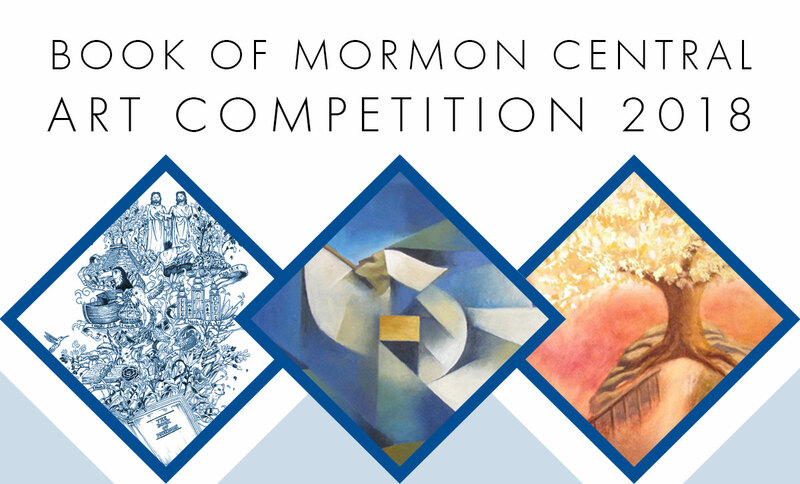 This competition was in conjunction with Book of Mormon Day 2018, and the winners were announced at the annual Book of Mormon Conference on April 7, 2018. The Art Contest Submission Deadline was February 28, 2018 and is now closed. If you have art work you'd like to submit, save it for next year's art contest in February 2019. Due to the challenge of judging art across various mediums, we will not be accepting submissions of music, literature, or film this year. Resolution: Resolution must be at least 300 dpi, and at least 2000x2000 pixels in dimension. Filename: Image files must be titled as follows: [lastname]-art2018. [file extension]. For example, if your last name is Johnson, the filename of your image should be "johnson-art2018.jpg" or "johnson-art2018.tiff"
If you are submitting a 3-dimensional work of art (sculpture, ceramics, etc. ), you need to provide multiple images of the work from different angles to be able to adjudicate the piece in the round. If you need to upload multiple images, please upload a .ZIP directory containing your images. You must title your .ZIP directory [lastname]-art2018.zip. If your last name is Johnson, the zip directory should be "johnson-art2018.zip"
Multiple entries per artist are allowed, but each piece of art must me made in separate form submissions.